Singapore is an ideal location for international businesses looking for an Asian base of operations. Its conducive business climate, unobtrusive tax regime, strong capital markets, and access to well-trained manpower all contribute to its position as a regional and global hub for several industries. Singapore has a few limitations as well, the biggest of which are space and rising costs. Iskandar Malaysia, a new economic zone in Malaysia’s Johor region, aims to take advantage of the increasing number of firms looking for more flexibility in their operations. Iskandar Malaysia began its life in 2006 after the Malaysian government decided that an economic zone in the southern part of the country would be beneficial for the social and economic development. The area around Johor Bahru was identified as the location for the new economic zone, which would be modeled after China’s Pearl River Delta Economic Zone. The Iskandar Regional Development Authority (IRDA) is overseeing the development of the five-zone area, which will include a financial/business district, an education and medical hub, the port of Tanjung Pelepas, and a logistics center. Like the Pearl River Delta EZ, Iskandar Malaysia is being developed as a complement, rather than as direction competition with its neighbors. Iskandar has made it clear that it does not want to attract investors away from Singapore, but it offers increased flexibility and scope for those already based in the city-state. For example, logistics companies can have their storage and transport facilities in Iskandar, while maintaining their human capital-oriented activities in Singapore. The manufacturing industry, which relies a lot on land and space, is another which is being lured by the opportunities presented by Iskandar. 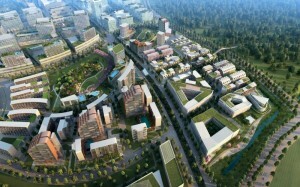 While the Singapore economy relies significantly on industry and manufacturing, allowing complementary operations to emerge in neighboring Iskandar is a much more attractive option than losing the sector completely as producers seek lower costs. While there are plenty of opportunities for investors in Iskandar Malaysia, the increased demand for property and land has meant that prices have been rising fast. There is some concern now that Malaysians moving to Iskandar to work may find it more difficult to find affordable housing, as Singaporeans and other foreigners push up prices. The government had previously implemented a home ownership program for locals, though the status of this program is unclear at present. Nevertheless, for foreign investors looking to break into the Malaysian and Southeast Asian markets, or those who want to incorporate in Singapore but are a bit turned off by the high costs of doing business in the city-state would be wise to consider Iskandar Malaysia as their base of operations.